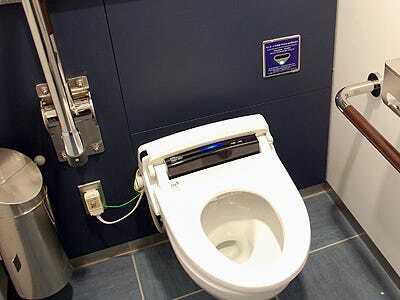 Airport bathrooms are—as Larry Craig could tell you—not exactly the most sanitary or safe places.The exception to this is, of course, spick and span Japan, especially with their newly opened international terminal at Tokyo-Haneda Airport. We had the opportunity to swing by the opening festivities a couple months ago while we were in Tokyo (see all those fun stories here), and aside from the old Tokyo mini-amusement park and other curiosities of the terminal, we were really taken by the attention to detail on everything else…including the public toilets. Believe it or not, these pictures are of a single toilet stall in the ticketing and check-in area, before going through security and airside. This is the most public portion of the airport and even here they’ve used what we like to call the “full-service” toilets with their control panel and options. Luckily most everything is in a multitude of languages and push-button, and there’s no under-the-door cracks for Craig types to start any mischief. The only problem here? If you noticed, the bathroom is out of toilet paper and needs the rolls switched over. Ha.